It's high time the institution stops rewarding privilege and levels the playing field for students from diverse backgrounds. A new batch of students at the Delhi School of Economics (DSE) is made to believe that they’ve arrived at the first stepping stone to intellectual stardom. Training in economics at DSE is supposed to endow students with sophisticated tools for the analysis of complex social realities. However, this hasn’t quite enabled the economics department itself to serve students who don’t come from privileged backgrounds. My experience in this department was that we were in denial about the way in which caste and class shape student-teacher interactions in our classrooms and the campus. While DSE dwells in its glory, a section of economics students has been continuously made to feel grossly inadequate over a gold standard that is set undemocratically. Does the responsibility of a public institution end after the intake of students through affirmative action policies? Is it not incumbent upon a public institution to be sensitive to the needs of all its students, and not just a select few? This letter was first drafted in June 2018, when I finished serving my time at DSE as a student and a teacher for bridge courses. At that time, this discussion was renewed between students and teachers, and this note was withheld from publication to facilitate dialogue in a non-hostile environment. Unfortunately, no real progress has been made. Some nerve-chilling stories of discrimination at the hands of faculty members in the department were also relayed to me, and are perhaps waiting to explode. The chief objective of MA (Economics) students’ orientation is to acquaint the incoming batch with failing and passing rules – a “major cause of distress”, we were told. Almost half the batch failed in at least one subject, and this was a badge of honour for elite students who passed all courses. The pattern to examination results is painfully repeated annually, the “best” and “worst” performers are found to belong to privileged and marginalised caste groups respectively. None of the students from scheduled caste category secured a first division in their semester I exams in November 2017; 84% of the students from this category could not clear at least one of the three compulsory courses. In all, 29% of SC and 41% of ST students could not pass all three papers in these exams, whose results were declared in March, 2018. Disheartened, a large number of students from these socially marginalised backgrounds drop out after the first year. There are no support systems to help and encourage students in an environment where failure is so severely stigmatised. The varied social and economic backgrounds of students is ignored by the “rigorous” syllabus. The starting point for students running this race of merit in the department is very different. Some of the unfair advantages that students from privileged backgrounds have had include training in English and Mathematics in better schools and colleges, access to computers (and even electricity), and the ability to pay for coaching classes for board examinations and entrance exams. Failure in examinations also brings with it a huge strain on personal finances. These students have to wait an extra year (or two) to pass, and have to incur the additional costs of living in Delhi, while still being unsure of employment and educational prospects. There is no telling if they will secure the degree or a job upon investing their time and money, even as the face pressure to support their families. The placement cell of the department functions as an independent trust which has taken it upon itself to fleece students. It mostly facilitates employment opportunities for economists and analysts in the corporate sector. A membership fee of Rs 2,000 and a down payment of Rs 12,000 – a sum which is refundable if a candidate is unable to find a job – is charged. Students from underprivileged backgrounds find it hard to make the down payment. Jobs in the private sector (where there are no reservations) are also almost always out of reach for these students. The revenue and expenditures of the cell are also not made public, nor do they come under the ambit of Right to Information. Why can’t a portion of these or other funds be utilised for the benefit of disadvantaged students – by way of remedial classes, English classes or free mental health counselling? Whose interests does this private entity, housed inside a public institution, purport to serve? By the second year, almost half the batch has been “left behind” as some have dropped out while others are forced to repeat a year. The students who get promoted hold the firm belief that the “failing” students do not deserve to be in DSE. Inside the classroom, seldom do these “failing” students find support in the faculty – who are well versed with theories of social justice and social capital. Interactions with teachers are hijacked by English-speaking students who were prepared to tackle the strenuous coursework at expensive coaching classes that helped them crack the entrance. Such students have the currency to freely exchange their ideas with teachers, who are responsible for writing letters of recommendation to students who wish to pursue higher studies abroad. We need to answer the question to understand how excruciatingly exclusive, we as an institution are: How many Dalit students have we placed for PhD studies in any of the big league colleges abroad? On the eve of a joint student-teacher committee meeting held to discuss more accessible teaching-learning methods, one professor went to the extent of reading out the marks of the toppers in a full classroom. The implication was this: Our brightest students seem to be doing just fine, the failing students clearly do not work hard enough. Such remarks, completely ignoring the varied socio-economic backgrounds of half the batch of students, are outrageous. Is it unfair to expect a modicum of sensitivity towards structural causes of inequality, that too from professors teaching us about “poverty?” This meeting took place in March 2016 to discuss some of these issues and was never convened again. Social interactions on campus are mostly mediated by the experience of social advantage given by caste and class. Groups of students who huddle together after class at the tea stall, study together and exchange class notes are mostly from elite colleges and institutes. 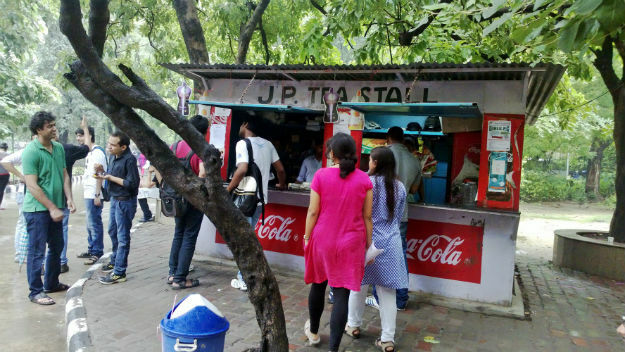 The tea stall at Delhi School of Economics. In a public meeting held after the tragic death of Rohith Vemula, an audience member proclaimed that she never enquired about the caste of a colleague before befriending them, but on serious self-reflection should have realised that all her “caste-blind” friends happened to be upper-caste. A deep seated superiority complex among these middle-class, upper-caste English-speaking students accentuates the sentiment of “humiliation”, as described to me by a current MA student. I emphasise, humiliation was a very careful choice of words from the choicest of vocabulary available to a Dalit student. The experience of humiliation is further made real by a public display of marks obtained – such lists of marks are easily found circulating among students, and discussions around a batchmate’s marks, followed by a verdict on his/her intelligence, isn’t uncommon. One of the foremost demands of the students is the institutionalisation of remedial classes, which will ensure that continued academic assistance is given to struggling students by trained instructors. This is a necessity because privileged students become high-scoring students. The disparate academic exposure and poor access to study material before MA for students from varied social and economic backgrounds can be substantially compensated for by these remedial classes. Currently these classes function as an act of benevolence of graduate students who are research assistants to the professors, and by no imagination are considered to be legitimate rights of the students, which they are. Institutionalisation would ensure that these classes are not construed as “charity” by the unremunerated ‘didis’ and ‘bhaiyas’, but as a measure of institutional responsibility by a public university department. Students have been suggesting the utilisation of the revenues of the placement cell towards the hiring of professional tutors (or filling vacant faculty positions). But the department, it seems, is comfortable with this current informal and non-institutionalised arrangement, where it is unaccountable. Although some progress has been made on this front due to the individual effort of few faculty members, it is hardly enough. Delhi School of Economics excludes a section of students who have braved unimaginable circumstances to get there, and it is high time that the institution stops rewarding privilege. Currently, students are not even demanding radical changes in the way the course is conducted, but are only asking for compensations on the margin, which are not terribly hard to grant. Some solutions have been clearly identified by students: an increase in student intake should be matched by a proportional increase in faculty hiring, remedial classes should be institutionalised, psychotherapists should be hired, and the placement cell must immediately stop charging a fee from students. The economics department faces a choice: either to level the playing field for students from diverse backgrounds, or to entirely give up on its foundational ideals of being a public institution. Aarushi Kalra is a PhD student at the Economics Department of Brown University. She graduated from Delhi School of Economics in 2017.